The Thirukandalam check dam across Kosasthalaiyar river in Tamil Nadu, built to benefit eight villages and agricultural lands on the flood banks, remains in a dilapidated state for almost three years. 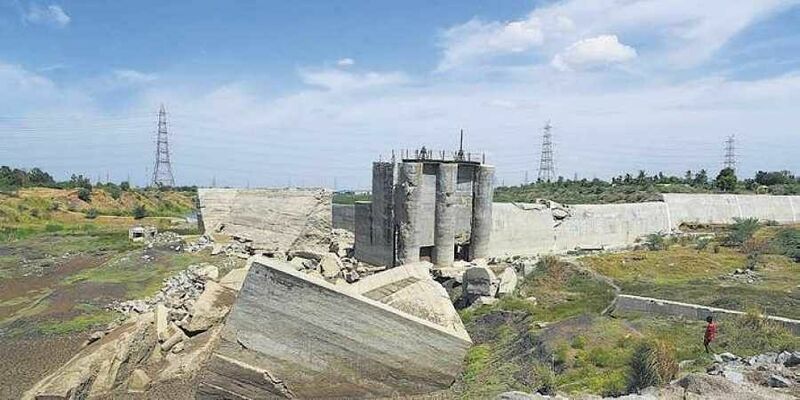 CHENNAI: The Thirukandalam check dam across Kosasthalaiyar river in Tamil Nadu, built to benefit eight villages and agricultural lands on the flood banks, remains in a dilapidated state for almost three years now. The `35 crore dam was broken down by the historic floods that struck the state in 2015. The abandoned dam is now home to miscreants and nothing more. The structure was built to save Krishna water for irrigation purpose. “The farm fields near Kosasthalaiyar are already losing water to industries. The government has taken no step to reconstruct this dam,” rued R Rajendran, a farmer from Guruvayal, one of the eight villages that would have benefited from the project. With a width of 175 metre and height of 5.5 metre, it is one of the tallest check dams in the state. The check dam, constructed almost 30 km from Chennai, had a capacity to store 160 mcft water. Completed in September 2014, it fell victim to the force of water released from Poondi lake during the floods a year later. “The flood banks and the river bed were washed away in the floods in mid-November, damaging the underpinning structures, leaving parts of the dam suspended mid-air,” said a PWD official. Over 79,000 cusecs of water flowed through the river, while the dam was built to face only 65,000 cusecs. Efforts by PWD to rebuild the banks with sand failed as the flow did not dwindle. The flow peaked again in December first week, around the same time Chennai was flooded, when over 83,000 cusecs flowed through Kosasthalaiyar, causing the structure to crumble. The dam has remained in the same state ever since. A team of engineers from Water Resources Department (Plan Formulation), inspected the site on November 24 and proposed a `40.5 crore renovation plan that would allow the check dam to handle a maximum flow of 1,20,000 cusecs, as per documents accessed by The Sunday Standard. This proposal was, however, dismissed owing to budgetary restrictions and a new proposal was submitted in 2016 by another team of engineers for `18.5 crore. This proposal was sent by PWD to the National Bank for Agriculture and Rural Development (NABARD) to obtain loan. NABARD gave an in-principle nod and the department was asked to complete the project before the north-east monsoon of 2017. A year later, PWD is still waiting for administrative sanction for the proposal. “We are still waiting for the department to approve the proposal. Work cannot be started without it. This may even cause an escalation of budget up to `21.85 cr due to inflation,” said a PWD source.